This weekend sees the UK’s answer to Comic-con in California, the SFX Weekender, arrive in Wales’ Prestatyn Sands holiday camp. 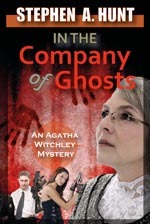 To help mark the event, I’m making my novella ‘In the Company of Ghosts’ free for download world-wide on Amazon Kindle from today to Sunday 5th February – the actual days of the event. ‘In the Company of Ghosts’ is a thriller with elements of fantasy and horror, and is the first in Stephen Hunt’s new ‘Spy-Fi’ series. If anyone’s going to the SFX Weekender this weekend, I’ll see you there – always happy to sign paper books etc.